FOR IMMEDIATE RELEASE: This week, Sunmaxx Solar and their team of installers, completed a commercial solar hot water system in a New Jersey high rise. “TribecaWest” is a luxury condo development project in Hoboken, NJ. The SunMaxx Solar hot water system will provide solar hot water to its 15 units. In New York City, the Tribeca neighborhood is known for it’s luxurious high end living — a close second to Park Avenue, of course. Now, the luxurious living of Tribeca can be found west of the the Hudson River, in Hoboken. Thomas Pintak, owner of Pintak Development, labeled Tribeca West as “Manhattan Living Comes West.” For Pintak, going west means going green. 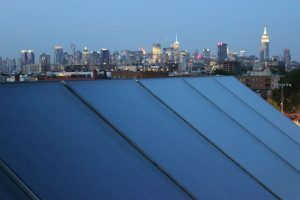 The 928 Jefferson Street high rise features thirteen of SunMaxx Solar’sTitanpowerplusSU24 premium flat plates. The company also installed a 211 gallon Stormaxx-CTEC tank which is pre heat solar hot water system. SunMaxx’s system is designed to offset 70% of the building’s domestic hot water load, saving 70% of buildings gas usage. For more information, contact SunMaxx Solar’s marketing department.